A sun-washed February morning warmed six diverse book artists as they separately explored the tributaries of a wandering Sonoran desert wash flowing from the Tucson Mountains west of Arizona's Old Pueblo. With unique backgrounds and skills -- calligrapher, painter, photographer, printer, binder and papermaker -- each sought inspiration for a project that would become their first collaborate book. Each noted significant elements of the wash, compiling a list from which their text would flow. Some were literal, others mystical, others merely imagined. 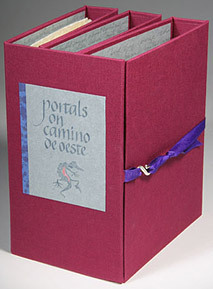 The result is a collection of six distinctive books that comprise a collaborative limited edition titled Portals on Camino de Oeste. Appropriate design and production details are found in each book. Each vision and concept is naturally and engagingly different, yet a similar vein courses through the set: butterflies float yellow rust prickly shadows crunch of sand dry water blue mountains purple highway refuge. 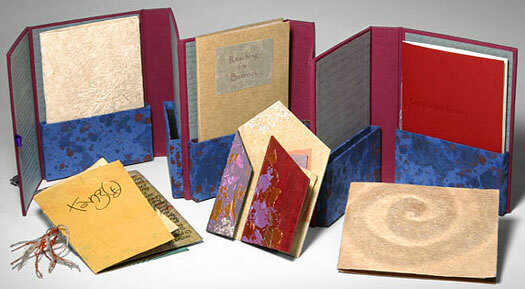 Twenty-six lettered copies and six numbered Artists Proofs (hors commerce) have been produced. Designed and handmade by the group, the case dimensions are 7 x 5.5 x 4 opening to 41 inches (18 x 14 x 10 to 104 cm). It is constructed using book board, Iris cloth for the cover, Gocco printed panels and hand painted Moriki paper covering the box pockets. The case closes with a silver "S" hook held by a ribbon. Donn Sanford, June 4, 1940 - August 30, 2004. Photographs by Kathleen Bober at www.kathleenbober.com.